West Cliff Estate - West Bay, Dorset. In 1891 the land on West Cliff had been used as a 9 hole golf course (West Dorset Golf Club), with a club house being built in 1894. In 1911 the golf club moved from West Cliff to East Cliff, to become its permanent home as an 18 hole course (initially 10 holes, with 8 being played twice!). According to maps of this time, there also existed a small reservoir owned by the Bridport Water Works Company. Its position would have been about 20 metres east of the junction of Hill Rise with West Cliff Road. On 24th October 1914, a part plot of land (15 acres) known as Watton Eweleaze on West Cliff (Watton Cliff) was sold by the Right Honourable Giles Stephen Holland Fox-Strangways, the 6th Earl of Ilchester, to William James Guppy (Grocer at 57 East Street, Bridport), Louis Henry Trevett (Hairdresser at 46 East Street, Bridport) and Samuel Gluning (later in 1945 to become Bridport's Fire Chief). The Earl reserved for himself and successors in title the right of way on foot or with vehicles over the roadways as then existing or thereafter made, subject to an obligation of contributing a due proportion of the expense of maintaining, repairing and cleaning the roads, until they should be adopted by the local authority. An access strip of land 40 feet wide with rights of way would also be provided, hence Forty Foot Way. The current estate roads of Hill Rise, West Cliff Road and West Walk were formed from existing tracks on the land. The First World War (Great War) between 1914 and 1918 prevented any further progress. In 1920 a syndicate was formed by the new owners. They built houses for themselves, then in 1921 split up the remaining land into building plots with covenants, to form the West Cliff Estate. Some wooden chalets were built, but the first permanent properties were: Cliff Corner, Leven Cottage, Beach House, Chesil View, Ilchester, Applecross, Sandy Combe and Egdon (names correct as at 2012). The roads and verges were retained in ownership for themselves. The covenants were designed to maintain a good standard and provide a basis for the future recovery of the costs of maintaining the roads and drains. These covenants were in perpetuity and remain in force to this day. Everyone who owns property on the original estate is a party to the covenants as a condition of purchase. No tree or shrub may be grown that unduly interferes with the views of other siteholders. No wall or fence shall be constructed to a height greater than four feet six inches. Not more than one house or bungalow with necessary outbuildings shall be built on each plot. Each plot owner to pay a proportionate part of the expense of maintaining, repairing and cleansing the roads through the Estate and also of the sewers and drains thereunder, such payment being made according to the rateable value of his plot until they be taken over by the Public Authority. In 1940 during the Second World War, the West Cliff Estate was billeted by the Army, with houses on the cliff being used by officers and their families. Artillery was installed on the estate to protect West Bay from possible invasion. The owners were allowed back into their homes after the end of the war in 1945. In the 1950s the estate took on the nickname of 'Nobs Hill' (from the 1945 film 'Nob Hill'). The estate continued to develop and by 1961 there were not many building plots for sale. About 200 metres beyond the top of the estate, (now the end of West Walk) are three further properties. 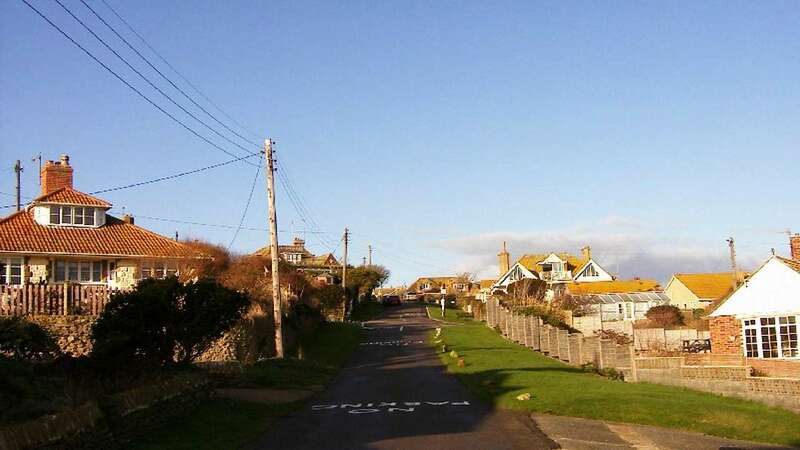 Cliff Cottage (originally West Cliff Cottages) is a thatched (terraced) building dating from the eighteenth century, Cliff Lodge built in the upper part of its land during the 1950s and West Cliff Farm, the buildings of which date from the late 1930s. Strangely, West Cliff Farm does not appear to be a party to any covenant, even though it requires access over the West Cliff Estate's land. The Earl of Ilchester's covenant contribution may have originally covered the farm's access, but this has not been paid for many years. In 1961 an adjoining field became available for sale but could not be developed for building without permission for access over the West Cliff Road. The trustees of the original estate, after much consideration, negotiated a financial agreement with the new developers, Messrs. Calverley & Sons. A deed was signed in which it was laid down exactly how the contribution should be paid to maintain the road of the new development and the access road of the original estate. A covenant, corresponding to the original estate was to be included in the deeds of each house sold. Unfortunately Messrs. Calverley & Sons went bankrupt before completion and the development was taken over by another builder who claimed not to have been party to the covenant agreement and therefore not liable. However, legal advice was taken at the time and the opinion was that the new builder clearly had a moral obligation to fulfil the agreement, but as this could be an expensive legal battle to enforce, no proceedings were undertaken. The developer did however complete the reinstatement of the roads, so West Walk was slowly completed. Then around 1970, the building boom began and the site of the upper estate was aquired by Messrs. T A Fisher & Co., who developed and extended further up West Walk as it is today together with Brit View Road. It was at this time that the roads on the estate were first named. The problem of maintaining the roads was then becoming difficult and in 1972, the Trustees of the original estate sold all the verges to the Trustees of the West Cliff Residents and Ratepayers' Association for the legal fees of £25. In 1972 an approach was made for the local authority to take over the surface drainage, but an official report revealed that the drains appeared to be incapable of accepting all the flood water after exceptionally heavy rain. It was the responsibility of the house owners to maintain or replace these surface drains as necessary. Work was completed on the surface drains in about 1983 and this seemed to solve most of the potential problems. In 1973 the possibility of the local authority taking over the roads was discussed but the estimated cost of £400 per house at the prices then, ruled this out. In 1974 the name was changed from "West Cliff Residents and Ratepayers' Association", to "West Cliff House Owners' Association". In the original agreement in the Ratepayers Association, no one could vote unless they had paid their subscription. The position as it stands today is that every house owner has a covenant in their deeds which makes it an obligation to contribute on an equitable basis towards the cost of maintaining the roads and surface drainage. Unfortunately these covenants are not identical. On the original estate the roads are owned by the trustees and the maintenance was based on the rateable value until 1983. On the lower end of West Walk, the road outside each property is still owned by the individual house owner and they in theory, have to maintain their portion on a frontage basis. On the upper portion of West Walk and Brit View Road, the roads were owned by the builders Messrs. T A Fisher & Co. until 2011, when the House Owners' Association officially took ownership for £1. In 1983 it was agreed by members of the House Owners' Association to seek a regular annual contribution from each household towards the upkeep of roads, certain verges, sewers and surface water drains throughout the estate. On 15th/16th August 1990, the estate was invaded by armed police and national media. An 8 year old girl who had been abducted four days earlier from a caravan on the holiday park was found in a derelict wooden chalet called Tree Tops. A 23 year old man was arrested and sentenced to a secure mental unit. Tree Tops was at the top of West Cliff Road and has since been demolished. The whole estate is private and maintained solely by the house owners. Their council tax payments do not contribute towards the estate's road or drainage upkeep, so the importance of maintaining high standards rests entirely with the house owners, with a goodwill and cooperation of all three sections of the estate. On 1st October 2011 following a Government directive, the local water authority became responsible for the foul sewerage system on the estate. The surface water system remains the responsibility of the House Owners' Association or respective property owners, depending on pipework location. Gas, electricity and water supplies on the estate are the responsibility of the appropriate utility companies. Contributions by: Basil Trevor-Morgan & Roy Downing - References from original 1914 & 1921 Deeds. Copyright © 2012 - 2019 WestBay.co.uk. All rights reserved.